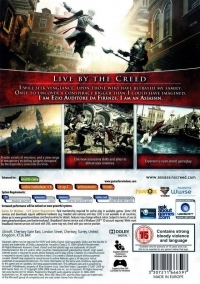 Box Text: LIVE BY THE CREED. I will seek vengeance upon those who have betrayed my family. Only to uncover a conspiracy bigger than I could have imagined. I am Ezio Auditore Da Firenze. I am an assassin. - A wide variety of missions, and a new range of weaponry including gadgets designed by the legendary Leonardo Da Vinci. 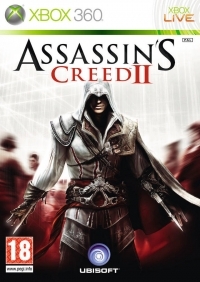 - Use new assassins skills and allies to defeat your enemies. - Experience open world gameplay. 05-17-2018 purdon Box Text LIVE BY THE CREED. I will seek vengeance upon those who have betrayed my family. Only to uncover a conspiracy bigger than I could have imagined. I am Ezio Auditore Da Firenze. I am an assassin. - A wide variety of missions, and a new range of weaponry including gadgets designed by the legendary Leonardo Da Vinci. - Use new assassins skills and allies to defeat your enemies. - Experience open world gameplay.